What a roller coaster! The night that I wrote about Hershey was terrifying. I fed him dinner that night. I watched him start to eat. I turned around for a minute and when I looked back he was staggering in circles, and then down he went, mouth frothing, chest heaving. "O.K., I said to the kids as they hovered around Hershey. "This is probably it. Don't cry while he is still alive. Let him go out seeing us happy." So we all smiled and held him, the kids holding back the emotions of having a dog their whole lives. But the tears broke loose. And then he got up. He could only go around in circles at first, and then he got a little better. Yesterday was better yet, and this morning he got up with me at 5 in the morning asking for a treat! I am cautiously optimistic, for a dog that is nearly 15 years old. I don't know what to make of it. Off to fish the Nestucca. Whooooo hoo! I can't believe I am going to do this. But I am going to do this. I am..... really! Just ate cinnamon rolls and scrambled eggs and now I am off for this adventure. I caught a steelhead yesterday! A beautiful, chrome summer steelie on the Nestucca! It tail danced, came clear out of the water, and gave me the show of my life! Now I'm hooked on summer steelies! O.K. I will go now. Really I will. I promised the kids and there is no backing out. If you see me bobbing down the creek without a paddle, rescue me. The Vet says Hershey should not be put down as long as he is not in pain. I remember back when Andrew was a baby, and he suffered from what they called "Febrile Seizures". They were nightmarish. He would be fine, and then his temperature would elevate to 104 or so really quickly and he would convulse. I learned from the Doctors that the seizures did not hurt Andrew, and were not dangerous, in and of themselves alone. It was the cause to be concerned with. And the Ambulance fee. I learned, but was never convinced that I could handle them alone, and then drive Andrew myself to the E.R. Every time we got a bill, Andrew's Father and I would say.... "Next time, we will handle it ourselves." So, very calmly he would call into me....."Jennie, Andrew is having a seizure." "O.K." I would say. "I'll be right in." I would walk very calmly into the room and pick his little convulsing body up. We'd walk to the bathroom to start a tepid bath, while he was thrashing in my arms. Then came the foaming of the mouth, then the color change. Then, losing all calmness I would shout "CALL THE AMBULANCE!". I simply couldn't do it. Not even once. He has outgrown those seizures, but I am faced with dealing with them on another level. My first child, Hershey. Seizures have to be the most frightening episode you can imagine. They should be rated, and my kids should not be allowed to view them. Last night at 7, after three days of thinking how well he was doing, how normal he was acting, he seized terribly. I handled it. Then I got out a sleeping bag and my sons mattress and parked myself for the night, next to his bed. 12:30 A.M. Another seizure. "BILLLLLLLLL!" I shouted upstairs. This one was worse. I thought it was over. I thought Hershey was over. Then he went into his crazy demented 'post seizure' walking. He and I walked around outside in the dark for over an hour before I could get him settled in again. Then one more this morning. The worst of all. I am back from the vets now, complete with a bill that is well worth it no matter what happens. Hershey is not in pain. We should try this new medicine. We shouldn't put him down yet, he may last one last summer. I am in pain though. Watching this, worrying about this. They say I will know when it is time to put him down, but I think "THEY" need to add something to the rule. Put an animal down when the owner or the animal is in too much pain. I'm going to be more cheerful. I'm trying! 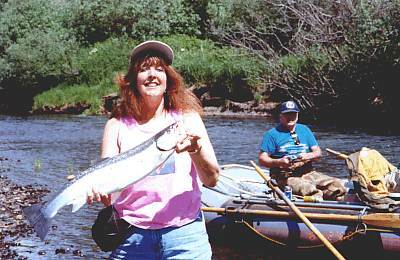 O.K... How bout a pic of my beautiful summer steelie off the Nestucca? Anyway... Hershey is hanging in there. I'm working on a page of bird pictures. I'm also going fishing tomorrow. YEE HAW! I slept last night! Hershey is doing a wee bit better. Constant decisions though.. To sleep or not to sleep? Hard to do when a dog comes up to you with a smile and a kiss and a slight waggy tail, but the next minute almost falls down the stairs. EESH. Today I got up at 5, did web work till 8, walked out to the chicken cage with my robe still on at 12...Its fun to be able to lounge in the morning! The birds fill the air with pleasant sounds, the mist sweetens the air, and high banks of fog wedge into the mountainside, making me feel all cozy and safe down here. I have new baby bunnies! Lets see how fast I can get them to die this time! No... I am being VERY careful not to touch or bug them too much. NO TOUCHY JENNIE! Leave them alone.......! If they die, they die, but I am not going to play surrogate Mother again! Anyway, I'm going out to go fishing... Tease the cutthroat for a while. BTW, Andrew and David found a cutthroat that was drowning, with a worm hook and a 1/4 ounce weight hanging out of its mouth. BAIT is closed! Drives me crazy! I mean, I like to tease fish, but tease and release unharmed PLEASE! Dang...... It's almost two... I have to think about dinner, and my arm is aching from computer stuff. Off I go, but before I do... Two pics. One of my birdfeeder right out my window, and one of me on the Nestucca playing that steelie.... Gives me a rush, and I need it!!!! Photos courtesy of Don Gach, Seasurf Internet! I love this! These are the cutest pictures! I'm sorry.. These should be on ibird.net, but I don't have that domain. Just take a quick peek here, and then go to the next one... They are awesome!!!... and then I'll get back to fishing! Nedonna Pond. Be there! This morning, 9 to 2. Free kids fishing day, and I am on my way, rain or shine. (It's pouring.) Going to stop for breakfast. Let me tell you, these people from the N.F. Hatchery really put on a nice event. Last year was first class all the way! My kids love it, but they are taking their own rods today. They do supply everything! Rods, reels, pop, cookies.... you name it, plus lots of smiles and encouragement! I admire this team immensely! Hershey has been having constant seizures since 7 last night, and the vet here in Tillamook said he was too tired to come put Hershey out of his misery. "Ma'am," Peter Miller said..."It's awful late tonight...." I'll never forgive him for what Hershey went through last night. Seizures, and losing all bowel and bodily functions, panting, couldn't drink, couldn't lift his head. Just pure suffering all night long. Peter Miller was not my usual vet, but the vet on call. What is a vet on call for? I am bitter. Out of all fairness, he did say that I could bring him into the office for this. But how do you bring a grand mal seizing dog in a car 10 miles into an office? I was hysterically crying when I called him. I guess vets get hardened after a while. This was sent in by a dear reader. It has helped me, and will help me today as I go to put Hershey to sleep. dies that has been especially close to someone here, that pet goes to Rainbow Bridge. There are meadows and hills for all of our special friends so they can run and play together. There is plenty of food, water and sunshine and our friends are warm and comfortable. The animals are happy and content, except for one small thing: they each miss someone very special, someone who was left behind. Forget divorce, forget anything I have ever been through. This will be the worst. Hershey is out of pain now. Next time you hear from me will be about fishing. I promise. Let's go sturgeon fishing with Mark Charlton! Hey, Bill and I and the boys are going out with Mark Charlton on the Columbia for sturgeon Wednesday the 21st of June, leaving at 6:00 A.M. Want to go? It is $75 per person, and there are 11 spaces open! Wouldn't that be a blast? His crew is a riot to fish with, and the cabin is comfy and fun! We can bring tons of food, and catch monster sturgeon! E mail me, and visit his page for more info. I think it would be a blast if some of the girls and guys out there bring your kids. Let's do it! I wanna be happy! The first 11 go! Always bring a third oar. This is the lesson I learned today. So you have fished with years with only two oars and have never needed an extra, right? Today on the Trask I experienced something very frightening. It didn't happen to me, but I was witness to a boat going down. It was an intense experience for me, and for them, I am sure. These particular fishermen have been down the Trask many times. Not novice at all. I don't even know their names, but they are regular Trask fishermen. On the first turn, (from what I understand) an oar got stuck, popped out of the oar lock, and the two men were left to run a narrow channel with overhanging brush and only one oar. It didn't work out. The boat filled with water and they were dumped. After floating over 100 yards downstream one man was swept under a recently downed, large alder. Unable to get his legs free, he was kept underwater until his buddy realized the predicament, and successfully rescued him. So please, pack a third oar, OK? You may only need it once, but this young man, (with a newborn baby at home, by the way) wished he would have had one! Scary! Oh! By the way, if you find an oar on the Trask, please e mail me.. They lost a box of tackle too, I believe. Let's get it back to them??? This, after listening to several scary water disaster stories told by our guest today, Roger Martin, was enough to make me sit on the edge of my seat for the remainder of the trip, and we HAD an extra oar! But I am a chicken sometimes! Anyway....R.T. of the discussion board is computer disabled for now, and will be absent from the board. Hopefully not for too long. Let's all bow our heads and say a prayer to the mighty computer Gods. P.S. He went fishing on the Wilson today, and connected with some summer steelhead. Way to go... R.T.! I want to thank everyone who wrote to me about Hershey's death. There were many nice thoughts directed my way. It is very difficult to pick words to comfort people in times like these. I must say you have all done a grand job, and I appreciate it more than you will ever know. I'm not doing great, but I did force myself to go out fishing today. It is hard to fish without thinking of Hershey, but I need to thank God for the time I had with him, and remember the good times. He will always live in my heart. Today the river was beautiful. Passing Scott Ammerman and his successful catches while staring at my stagnant line was a little disheartening, but I needed to get out. Great company, lots of laughs, the beauty of the river.... I am thankful for my life. It hurts lots sometimes.... but there is SO much good in it... really. I remember once about five years ago, going out fishing for summer steelhead the day after the closure and hooking 6 chrome, beautiful spring chinook. WAH! It was an experience I will never forget! Some people were fishing last night at the Kilchis logging bridge. We saw them on the way to the store and on the way back still there. Bill insisted we stop and check it out, since there was a bright red bobber floating around looking much like bait fishermen. Sure enough, they were fishing with eggs for springers. They were catching cutthroat trout, and I believe this is why the Kilchis is closed for bait fishing. To protect these fish. I think that the synopsis should be more clear about which rivers are closed for bait at which times. For instance, why is the Kilchis not open for bait until September 15th when the rest of the area rivers open on September 1st? I don't get it. Jim Erickson went out Sturgeon fishing in the Columbia Estuary yesterday and caught one 8 foot sturgeon. He stated that very few fish were being caught and the crab and mudcat were terrorizing them thru out the entire tide and area. On an encouraging note, R.T.'s success with summer steelhead yesterday plus reports that several summer steelhead were caught by salmon fishermen in tidewater last week, encourages me to think that the Wilson may have a lot of potential for summer steelhead angling in the next few weeks. Let's get em! I'm getting the bug, personally to go out sturgeon fishing, and that is what my schedule will include in the near future. Many opportunities await Oregonians and Washingtonians at this time of year. There is simply no reason to be without a rod in hand. My bunnies are alive and well this morning. Their little eyes are almost open and they have furry little wiggly bodies! They are so darn cute I just want to hold one all day. Still on the lookout for a small lab or hunting dog mix. I'm not particular. Just want a dog exactly like Hershey!!!! Happiest of all Father's Day to all of you fishermen out there! I spent the glorious morning outside washing windows. You know how the sunshine is so pretty streaming in until you notice the winter buildup? Well, mine are clean, inside and out, and tomorrow the weather report says drizzle. ARGH. They are pretty now though! After working, filling the bird feeders, feeding the precious bunnies and chickens, I took a break with my kids. We went out to the river and played on inner tubes. We scoured the river bottom for lures, agates and treasures. We tested our luck on the curlbacks At times the kids were totally underwater going thru them! What fun! "Forget Disney World!" Andrew said..."This is awesome!" I love how he sees things, having lived the first eight years of his life legally blind. He uses the most descriptive terms. I suppose he learned to listen during those years more than see. His vocabulary is tremendous, and things aren't just 'pretty' to him. They are amazing and beautiful. Water trickling down the moss green, rocky cliffs into the river in the sunshine is iridescent, sparkling like diamonds, shouting with color! I love listening to him. It is a definite upper! After the swim I meandered into my garden and began the mind soothing, monotonous process of pulling weeds. My thoughts traveled off to my Grand Father. My Grand Father was a huge influence in my life, and I like to think he liked me best of all the Grand kids. Truth be told he probably liked us all 'best' for one reason or another, but I liked how he liked me. He had several illnesses that he overcame, and could relate to me, I like to think. He fought every health challenge and overcome them all. He encouraged me in everything from fishing (which was a big part of his life) to music, to education. I felt he was always there for me and referred to me as his "little Jennie". The day my Grand Father died was sunny like today. He was out planting the seasons corn on his century farm. Grandma called him in for dinner. His cane helped him make his way slowly into the kitchen, a satisfied smile on his face as he announced that he had gotten the corn in. I imagine him feeling relieved and refreshed from what he loved doing best; working on his farm, sustaining his life, being self sufficient. He made it to his chair in the living room and collapsed into a peaceful death. If we have to go in this lifetime, I can think of no better ending. Happy Fathers day to all who are here on Earth, and all who are fondly remembered. New at Ifish! A column of tips, complaints and insights by controversial fishing personality Jim Erickson. The column will be called..."Jim Says". Go check it out! I have been scurrying and hurrying this morning to catch up on all the work I couldn't do last week due to the Hershey thing. Someday I need to write about that terrifying night that he seized all night. I need to get it out. Not today though, I'll spare you. Trying to get everything done so that I can fish tomorrow a bit, and definitely on Wednesday with Mark Charlton. Secret: Don't tell... I'll be in big trouble. Cullaby Lake on the North Coast has been putting out some killer size crappie. Up to 17 inches. I wasn't going to tell, because I wanted them all for me, but I can't seem to get enough time to go North. Off I go.... I wish R.T. would hurry up and come back. Don't you? Thanks for the pic of Joe Studier's catch! Don't forget to sign up for our new Contest, sponsored by Lightning Strike Lures! Remember.. There is still room to go on a super sturgeon charter with Mark Charlton on Wednesday at 6:00 in the morning. The phone number to call is: (503) 861-2429 and book it! It costs 75 dollars for the day.... Can't wait to go! I am sooo excited! We all know that life is a series of ups and downs. Life goes along swimmingly like a big old Fall Chinook feeding in the ocean, eating the bounty of food available. Then you make your way to the lazy river that feels safe and familiar. Look out! There are many hazards in the calm water and I swallowed the hook! Hope this time I get released! Been a challenging run for me, with my 15 year old dogs death, then R.T. of the discussion board off due to computer problems. Then a disappointing eye appointment for my son. Many other things have been casted my way, lures of assorted colors, sharp cutting hooks, enticing offers that proved deadly. But that is another fish story. Now I am sad to announce that Stan Fagerstrom is leaving ifish. He has freely written articles for ifish for over a year, and I will dearly miss them. As of August 26th, Stan's articles will no longer appear on ifish. I wanted to publicly thank him for his fine work and dedication to the sport of fishing, and Ifish.net in particular. I also want to thank him for his friendship and support, which he has promised to continue. He is a dear gentleman in every sense of the word. Anyway..... Lots of good things too. Like fishing. That is what I am going to do tomorrow. I can't wait! Amazing how you can forget the real world when the 'reel' world takes over and screams with the weight of a sturgeon! The looks on my kids face when they see what they expect on the end of a line. A trout. Then they see..... what? A REALLY BIG TROUT, MOM! Really, really big! I hope this trip turns on the fishing bug for my kids. It is a huge hope for me. I want to grow my own fishing partners! Off I go, into the world of computers, file after file after file. Trying to keep the spirit on ifish, and the spirit in my heart alive with the wishes of fishes! 45 years old. A musical friend of mine and teacher at Warrenton schools died yesterday of a heart attack in front of his 4 young girls at the Seaside Aquatic Center. 45 years old!!! I will miss him dearly as will the entire community. I am still in shock. Life is very iffy and these things sure bring them home. Fish like this is your last day! My brother wrote me an interesting letter about his latest fishing trip. "Hello you nut. I found your web page and I think you need to add some credibility to your fishing report. I took customer down Dechutes River from Warm Springs to Trout Creek take out on two day overnight fly fishing venture with Action anglers, Mike Dooley as chief guide and cook. Fishing was great and he said he met you at some fishing show or something. Seriously the dry fly fishing was hot with Salmon fly hatch going on. I missed a bunch yet still managed to catch about 7 or 8 fish. It was as good as Mike had seen it and an experienced fly fisherman along with me Steve Moore of Johnstone supply caught about 20 trout overall. All catch and release up to 18 inches that day." I went fishing with Mark Charlton yesterday and the fishing was off and on as it has been. We had a great time, and believe me, we will not be needing any sturgeon anytime soon! We have the cooler full, the smoker full, and the bbq ready! What a grand time we had. The kids got to fight their big fish, and David got the 50 inch, 32 lb pig of the day! Go Dave! It was so fun watching him! I will have an entire pictorial of the trip A.S.A.P. Can't wait! Got some GREAT pics! What else? Oh yeah, I removed the link per Stan's request for his articles. I still have a lot of work to do to remove all of the links, but it is a start. Life is tremendously busy for me lately, and while I am gone, there is nothing I can do to update Ifish. I have no laptop.I will leave important info for ifish with R.T., so if you have any problems can you e mail him? He has my cell phone number and admin info. Len Self sent me some recent sturgeon trips pictures! Go see them! Got the story up about our Charlton Charters Trip. We had such a great time, and I know we'll never forget it! If you ever want to take the family out... this is a wonderful experience! I remember now where he got it. Andrew once said to forget Disney World when he was floating down the Kilchis River-that floating down the river was better. I totally understand! I remember going to D. World and snorkeling. We would get on our gear and float thru this tank. The view of the bottom of the 'look alike' sea was so clear and beautiful. I think it helps when you have vision problems to stare into the magnification of the water. I have taken on a new love for the Kilchis river. Floating down it again today with my kids was just wonderful! I get my work done, take a break with the kids and go up to the park to put in and float home. On the lazy stretches and deep pools that hold beautiful Chinook in the Fall, you can see everything that you can't on a winter drift. Every stick, every rock comes shouting up at you through the clear bright water. I studied it as we went along to see exactly where I would place my lure when the time comes. Anyone who has been on the Disneyland submarine can appreciate the relevance here! It is magical! I also am learning alot about current and becoming not so ignorant about the power of this huge force. I was far away, staring into the water and didn't hear the rush of the next rapid. I found myself headed straight down a riffle into a huge boulder! AH! No time! The bow of my rubber raft went straight into the rock and curled up and I saw exactly how these things can end. Not so good. Water poured in the middle of the boat. The current was unrelenting! This rock wanted me! I yelled at Andrew to help but he was smart enough to 'just say no!' The current would have had him too! Anyway, I finally rolled off the rock as the weight of the water in the water changed the balance. Whew! I did NOT like this. Off I go to bed. Just had to write about today. I love to drift this river! And I am getting pretty darn good at it! Michael Teague sure puts out an awesome fishing report via e mail. You might want to write him to see if you can get on the list. Very informative and well written! Heard a glimpse of a rumor that Wilson river steelheading is red hot. Good time to try out those jigs or spinners. When I get home, that is the first thing I am going to try: Fishing jigs on the Wilson. I have never caught a steelie on a jig, but that is going to change! Check out the new Portland show: The Hot Tamale Outdoor Show online! Really well done web site! I haven't seen the show and would love a tape of it! Anyone have one? I have my fly rod and reel, vest and flies all neatly packed away in my car. Bikes are bunjy corded to the bike rack, suitcases piled high and ready to hit the Metolius and the lake at Black Butte. I can't wait! I don't know though. Sometimes I look around at where I live and wonder why I would ever want to travel. I want to explore all of the nooks and crannies right where I live! Plus, I love my chickens and bunnies and I will miss them dearly! By the way, anyone want a bunny? Please? They are for pets, though. Not shish-ka-bunnies, please. O.K., I'm outa here. You guys have fun catching fish, and I'll have a great time catching a fish instead of my ear this year.